As personal memoirs and oral histories of octogenarians go, Life is a BEST REMARK From God is a nice book. 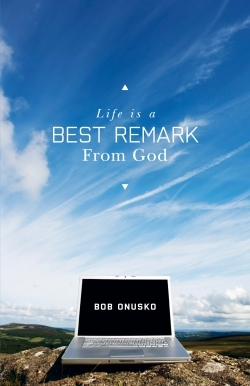 Bob Onusko writes simply, candidly, and with a wry sense of humor about the stages of his life: growing up during the Depression and World War II; going off to war in Korea; working at Westinghouse; raising a family; and then retiring, mostly to play golf, in Florida. His has led a pleasant and, as he says, a “good life,” and one for which he thanks God for having blessed him with good fortune and good friends. Mr. Onusko’s book is sprinkled with what he calls “best remark” quips—most of them pleasant if frequently trite little sayings and inside jokes, many of which appeared in columns he wrote about golfing. The book is a rambling but very readable account of a mostly happy and very normal life, and Onusko freely admits that he often got “carried away [with his] remembrances” while he was writing. Meant as part family chronicle and part diary for his children and grandchildren, Life is a BEST REMARK From God is exactly what the author intended to produce: a loving, laughing legacy to pass on to his descendants. Onusko’s book does, however, have added value as a social snapshot of life in working- and middle-class America from 1930 to the present. There are stories of work and play, of raising a family and spending time with friends, and of, just living life one day at a time. Onusko shares his memories of seeing famous baseball players, watching classic movies, and enjoying penny candy and perhaps a few too many strong drinks (“I heard you missed some shots!” he notes being chided. “How come you don’t miss any at the 19th hole?!!”). The sections dealing with his career get a little dull, but even here, when talking about people he knew and worked and socialized with, the author manages to present a slice of Americana from days past.